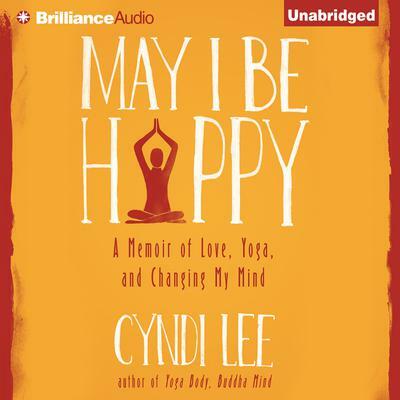 “How can I help others grow and transform if I haven’t done it myself&#8202;&#8202;?” Cyndi Lee asks in the opening pages of her memoir, May I Be Happy, where she makes a surprising revelation. In spite of her success in physically demanding professions—dancer, choreographer, and yoga teacher—Lee was caught in a lifelong cycle of repetitive self-judgment about her body, which was infecting her closest relationships—including her relationship with herself. Inspired by the honesty and vulnerability of her students, Lee embarked on a journey of self-discovery that led her outward—from the sacred sites of the parched Indian countryside to the center of the 2011 earthquake in Japan—and inward, to seek the counsel of knowing women, friends and strangers both. Author and actress Jamie Lee Curtis, visionary health pioneer Dr. Christiane Northrup, and a founder of the self-help movement, Louise Hay, each have wisdom to impart. Applying the ancient Buddhist practice of loving-kindness meditation—“Normally you do it for others,” a sage scholar advises, “but you must do this for yourself right now”—Lee comes to learn that compassion is the only antidote to hate. With candid, contemplative prose, May I Be Happy gives voice to Lee’s belief that every life arises, abides, and ultimately dissolves. By becoming her own best student, Lee internalizes the strength, stability, and clarity she imparts in her Buddhist-inspired yoga classes.